Everyone wants to call Venezuelan President Hugo Chávez the new Fidel Castro. The comparison is inexact. For one thing, Venezuela's media (so far) can rail at Chávez without going to jail. 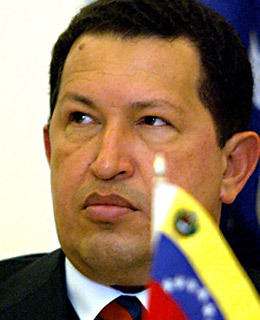 And while Castro in his cold war heyday was propped up by the Soviet Union, Chávez is a self-sufficient revolutionary. He controls the western hemisphere's largest oil reservesand one of the U.S.'s most important foreign sources of crude. Record-high oil prices, as a result, have given Chávez a geopolitical profile that is rare for a Latin American head of state. His Bolivarian Revolution (named for South America's independence hero, Simón Bolívar) is spreading an antiglobalization, anti-U.S. gospel that's increasingly popular around the region and overseas. "Chávez is a radical," says a high-ranking U.S. official, "but he's a radical with deep pockets." The Bush Administration says Chávez is trying to use that wherewithal to destabilize the region, as Castro tried to do in the '60s. Chávez, 50, a former army paratrooper who led a failed coup in 1992, was elected in 1998 riding a wave of outrage against Venezuela's corruption. Prone to bellicose rhetoric (last year he publicly called President Bush, in Spanish, an "a__hole"), Chávez is a survivor: he outlasted a recall referendum last year, a general strike in 2003 and 2004 and a coup attempt in 2002. Although Chávez is out to redress the chasm between rich and poor in Latin America, critics say he disdains democracy, noting the mass firings of public employees who had signed recall petitions. Chávez, who under his new constitution can run for one more six-year term in 2006, insists he's creating a more genuine, grass-roots democracy. But if he finds a way to stay in power beyond 2012, the hemisphere may very well have its new Castro.